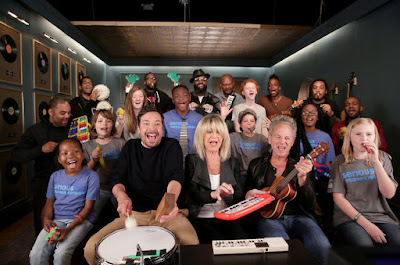 Lindsey Buckingham and Christine McVie were joined by Jimmy Fallon, The Roots and kids from SeriousFun Children's Network for a performance of Fleetwood Mac’s 1977 classic, “Don’t Stop”, on The Tonight Show on June 12 and video from the program is available online. Using a variety of children’s instruments, the lineup were celebrating news that Fallon’s “The Tonight Dough” collaboration with Ben & Jerry's ice cream had surpassed the $1 million mark in funding support for SeriousFun's 30 camps and programs around the world. Launched by actor Paul Newman in 1988, SeriousFun’s camps for kids with serious illnesses have served more than 700,000 children and their family members in over forty countries to date. Buckingham and McVie are making the rounds promoting their newly-released self-titled debut album. The pair performed the project’s lead single, “In My World”, on The Tonight Show on June 8 as part of the launch of the record, which they’ll debut during a series of summer dates across North America starting June 21 in Atlanta, GA.